Every day I get followed by Twitter accounts that are obviously using some sort of autofollow tool triggered by a keyword in one of my tweets. I know that they are autofollows because it is clear that the account has no interest in my content and it is unlikely I would be interested in theirs. Most use a crude keyword trigger so that if I were to tweet that I hate carrots I would be followed by carrot vendors, which is clearly pointless. Mostly these accounts are also just broadcasting a sequence of prefabricated tweets, something I can verify just by sending an @reply to see if there is a human who can respond. Usually there isn't. Most social media and social networking sites allow some limited interaction between different channels. So, for example, you could link your Twitter and LinkedIn accounts so that all your tweets go into your LI status updates. Using tools like Hootsuite and Tweetdeck you can also schedule actions across several platforms at certain times. And there are many tools that allow you to setup automated responses, like the annoying direct messages some autofollow robots send when you follow their account. Every week there is a new wave of Facebook scams and hoaxes. Sometimes it is a warning that you will have to pay for Facebook if you don't click on a link. Other times it is the promise of seeing who viewed your profile, if you click on some link. There are others promising the Secrets of Farmville -- if you click on a link. This week one of the most popular Facebook scams is the one announcing that Apple is giving away free iPads in memory of Steve Jobs, you just have to click on that link. But click on any of these links and bad things happen. 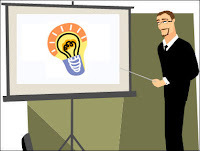 When someone has a great idea -- a new product, a reorganization, a cost saving move or whatever -- what often happens is that they make a presentation to the decision maker in a meeting. This is actually one of the worst ways and makes rejection much more likely because it doesn't take into account human nature. Rarely do decision makers decide in isolation; usually they are influenced by the opinions of others. If everyone else in the room is shaking their heads as you speak this is going to have an impact on the final decision. For this reason in workshops and one-to-one coaching I always combine practical speaking and presenting techniques with the essentials of influencing strategies and tactics, based on research in applied psychology and some tested methods that have proven very effective in the past. From time to time a clever hoaxer manages to fool the media with a fake press release, normally backed up by a fake web site. Usually people do this simply to make a point, a tactic used very effectively by the culture jamming group The Yes Men. More recently it was used by Taradeep Gill, a Canadian Web Developer frustrated by having to make websites compatible with older versions of the Internet Explorer website. To shame people into updating he issued a press release in the name of a non-existent company called Aptiquant that was alleged to have conducted a study showing that browser usage correlated with intelligence, with Internet Explorer users having the lowest. Sent through PRWeb, the release was backed up by a fake company website. Some major media outlets were fooled by this hoax -- I will not name names to avoid embarrassing them -- much to the surprise of Gill. When people hear about you for the first time very often they will Google you just to see who you are. If they don't like what they see this could reduce your chances of being called to interview for that dream job, getting a chance to pitch your business idea to a wealthy venture capitalist or whatever it is you are trying to do. Luckily fixing your online reputation is much simpler than most people imagine because the average busy person is not going to read pages of Google results and other web pages. In my experience most people are content to look at just the first page of the Google search results and rarely click on any link unless they see a problem. And to fix this first page for most people it will be enough to follow these five simple steps. This was written in 2011. Several sites mentioned here have changed or are no longer important. According to knowem.com there are more than 500 popular social networks and new ones are emerging all the time -- Google+, Dribbble, Zerply, Diaspora, Geekli.st and many others. Nobody can be active on all of them and even maintaining a presence on more than just a few is impractical, so which of these networks do you really need to be on? Luckily there are just a few that are either essential or very useful for professional networking, plus there are a couple more that are likely to be important in the future. Here they are: the five networking sites useful for your career and what you should be doing on each of them. LinkedIn: ESSENTIAL. Everyone should have a profile with a photo. If you are a rising politician, the founder of a interesting startup or a successful athlete sooner or later you will be hearing your own voice on the radio. Most likely you are not going to like the result, especially at the beginning. All the time I hear people say "I don't like the way I sound", "I hate the way I sound" or "do I really sound like that?". It's not just beginners, too. 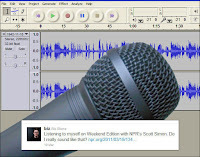 Not so long ago even Biz Stone, billionaire founder of Twitter was tweeting "Listening to myself on Weekend Edition with NPR's Scott Simon. Do I really sound like that?". So what, if anything, can you do about it? Here are some practical ways you can deal with this problem.